The successful launch of your 5S campaign is determined by your level of employee involvement and their continued commitment to 5S. The initial stage of your campaign, prior to any sorting or red tagging, is the awareness and educational stage. We have designed an entire suite of 5S visuals for your workplace. Regardless of your sector or facility type, our 5S visuals are designed to be clearly understood by all. 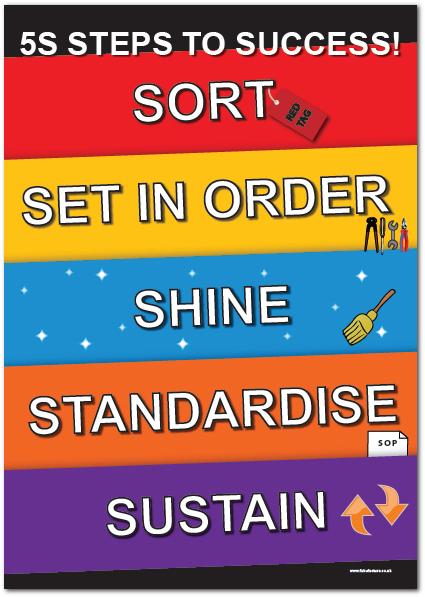 Kick off your 5S awareness program with this multi coloured 5S steps visual. The artwork is designed to grab attention and educate. All of our 5S signs are available in Premium Poster (A3 & A2), as well as self adhesive vinyl, Foamex board and heavy duty PVC banner.